Cornish Pirates captain Gavin Cattle believes they will have to be at their best if they are to knock Welsh Premiership leaders Pontypridd out of the British and Irish Cup. 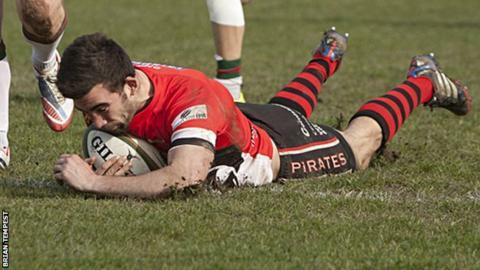 The sides meet in Sunday's quarter-final at the Mennaye, with the Pirates aiming to repeat their 2010 Cup win. "We're in for a tough day at the office," Cattle told BBC Cornwall. "We've got to raise our game, build on last week's positive performance and embrace the occasion." One of the try-scorers was former Pontypridd centre Tom Riley, who grew up just a minute away from the club's Sardis Road ground. "It was inevitable that we would be meeting at some point," Riley said. "They'll bring plenty of passion as well as some superb skills, so we'll be in for a tough test if we're not on the money. "If you look at their group they took the scalps of London Scottish and London Welsh and they're dominating their league. "They can't be under-estimated by ant stretch of the imagination."